To request a copy of our printed brochure, containing information about our projects, a guide to your placement and your application form, simply complete the form below. 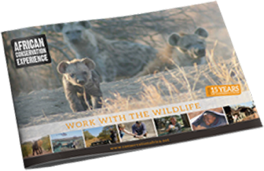 All information contained within the brochure can also be found in more detail on our website, along with a comprehensive application form, so there’s no need to wait to kick start your conservation travel adventure. Subscribe to Bushwire, our e-newsletter containing news and updates from African Conservation Experience.